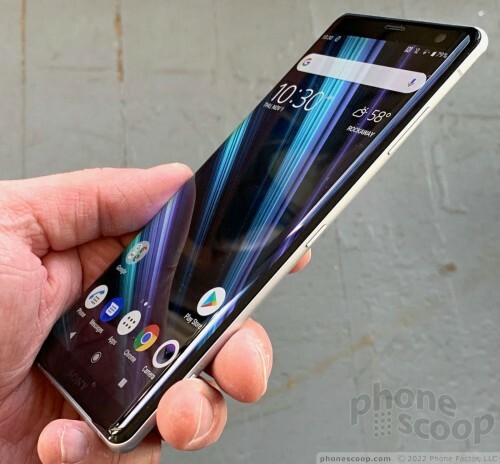 The Sony Xperia XZ3 is for those who want a svelte, sculpted phone that comes from a company other than Apple, Samsung, or LG. This sleek metal-and-glass affair manages to pack an amazing number of features into a stunning piece of hardware. If you want good looks and top performance, this is the phone for you. This is an inspiring phone. 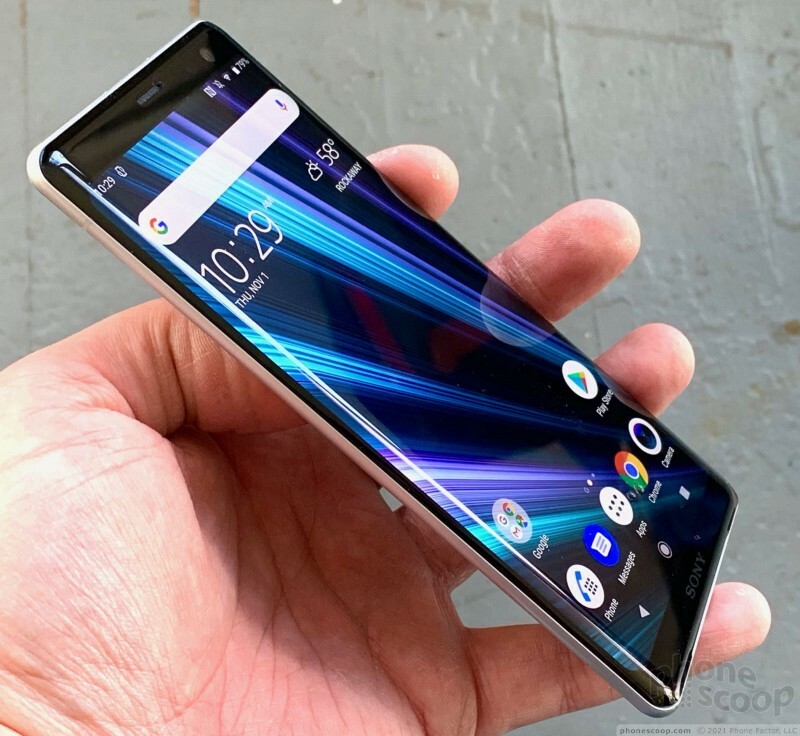 While Sony carried over many of the basics from last year's XZ2, the new XZ3 has a smoother exterior and more cohesive personality. 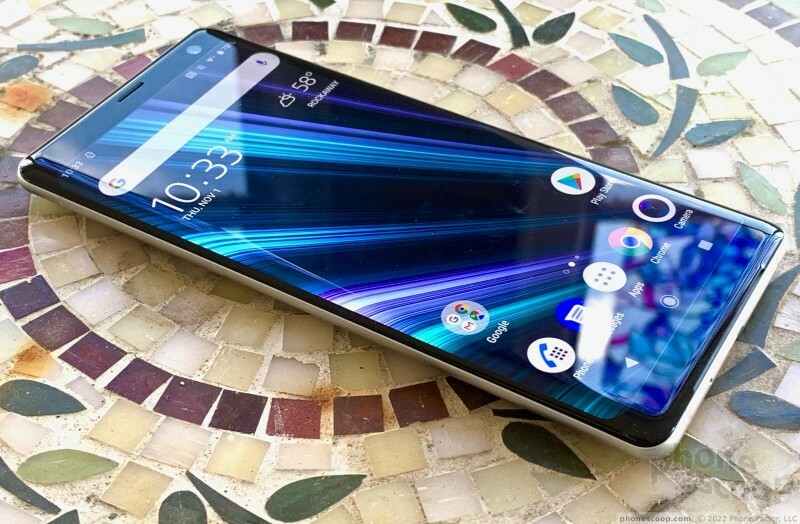 The XZ3 makes good use of Sony's liquid design. The phone has a narrow series-7000 aluminum frame between two panels of Gorilla Glass 5. It's perhaps the smoothest, most seamless device I've seen from Sony. The curved glass edges on front, in particular, blend deeply into the aluminum frame. 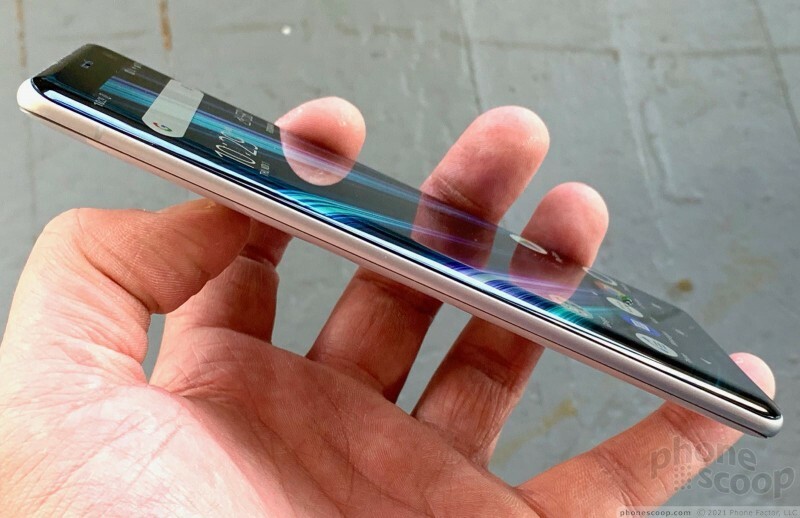 The glass on back has a more rounded shape. There are no hard edges anywher; only silky smoothness from top to bottom. 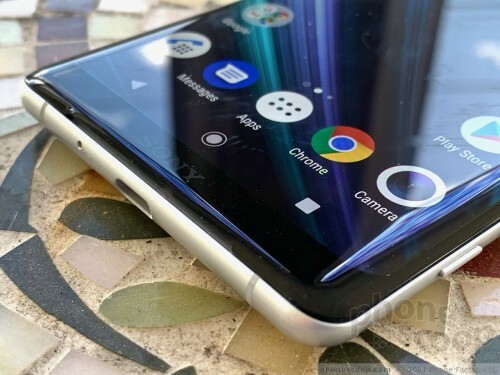 I will point out that the shape appears to be inspired a bit by the Samsung Galaxy S9+. The phone comes in several colors, including black, white, red, and green. 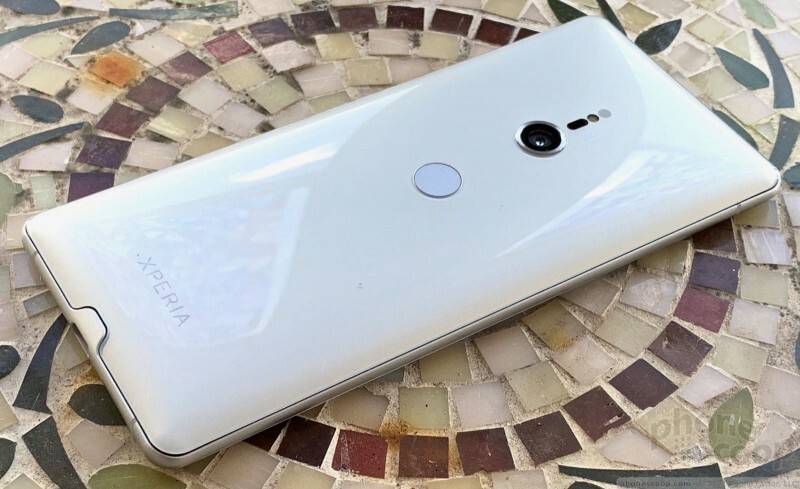 Our review unit is white and incredibly glossy. There's no texture at all to the glass. 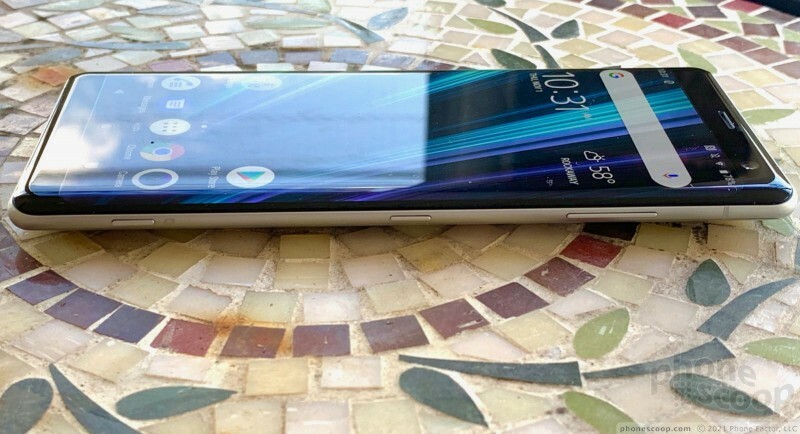 The XZ3 is tall and narrow. With a 6-inch screen, you know the dimensions are going to stretch what's comfortable in the hand. 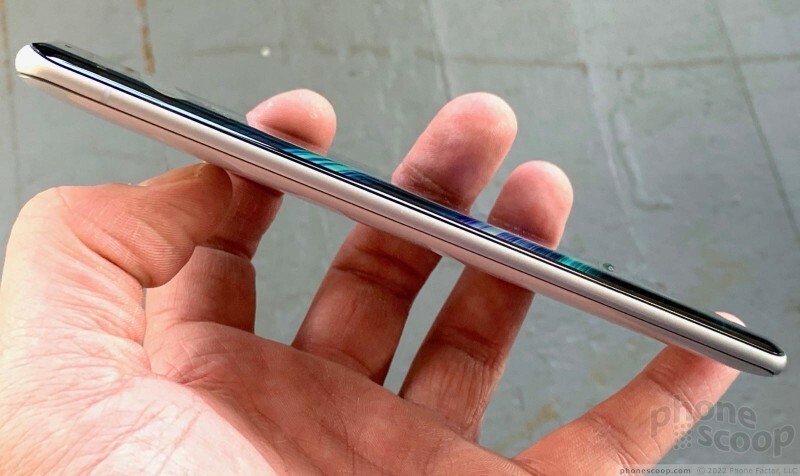 It's as tall as an Apple iPhone XS Max or Pixel 3 XL, but noticeably narrower than both. The narrow width really helps with in-hand comfort. It's painless to hold and use. You can slip it into nearly any pocket. Hold on tight, however, as the phone is among the most slippery I've ever tested. The materials and build are top notch. 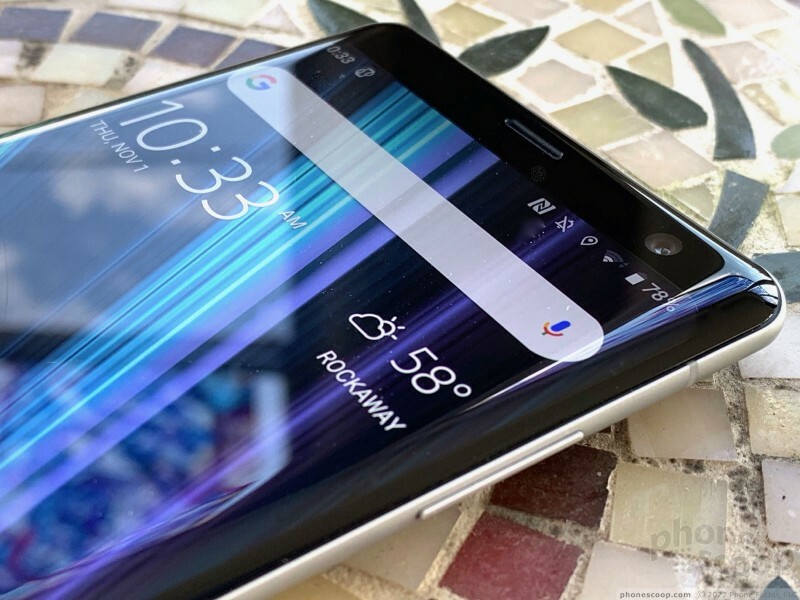 It feels as good as it looks thanks to the strong aluminum and curvy glass. 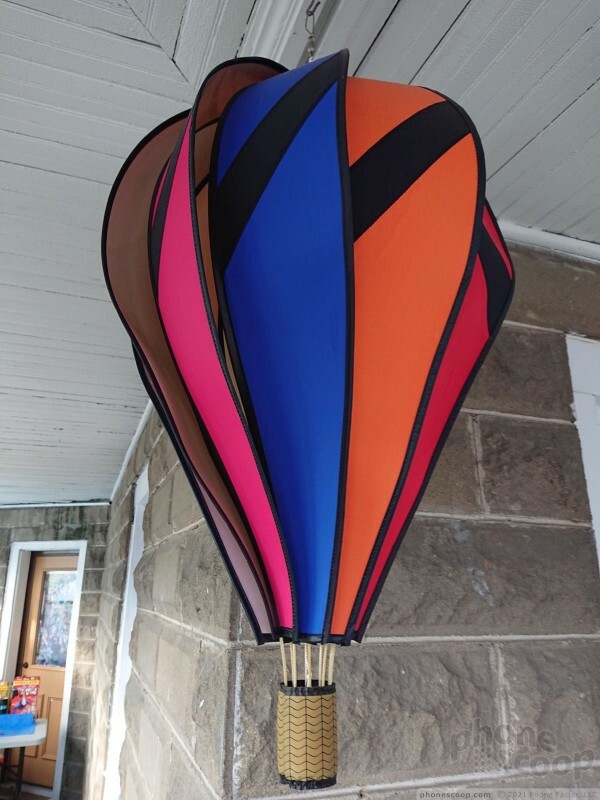 The exterior pieces are fitted together perfectly. The phone is rated IP68 for protection from dust and water. That means it can handle a 30-minute bath in up to 1.5m of water. Don't drop it. Gorilla Glass 5 is tough, but not impervious to breakage. Like many others, this is a fragile flagship. Sony finally has the face figured out. 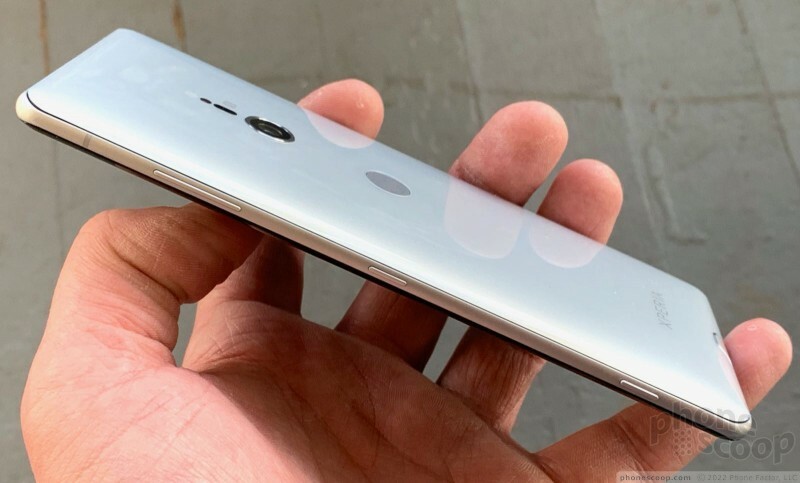 The side bezels are all but gone, and the phone has acceptable bezels above and below the display. This resolves one of the biggest ongoing complaints I've had with Sony phones over the years. It's almost as close to "all-screen" as we can expect right now without something like a notch. I like that the screen has curved corners that match the radius of the hardware. The only non-screen elements you may notice on front are the small slit for the earpiece and user-facing camera. 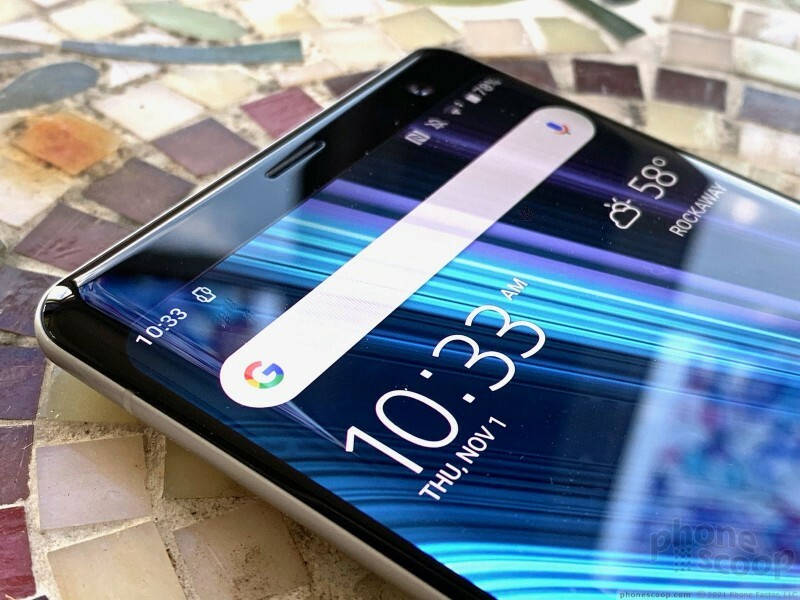 The XZ3 adopts Sony's long-established side button configuration. 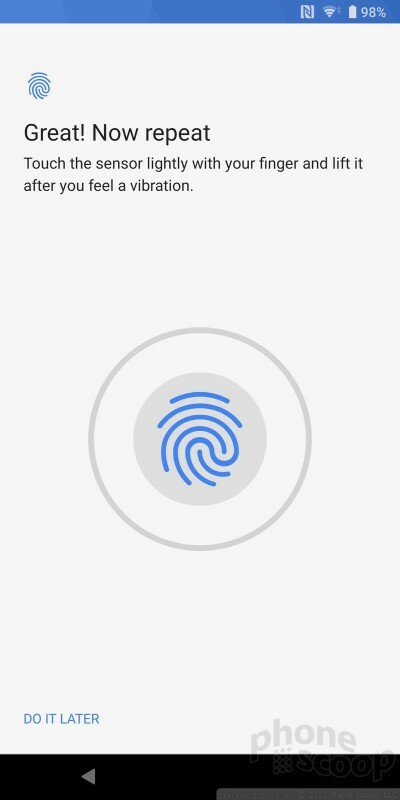 Three buttons are positioned on the right side: the volume toggle, screen lock key, and dedicated two-stage camera button. The buttons are rather thin and I wasn't pleased with the feedback. The screen lock button is okay, but the volume toggle left me wanting more. 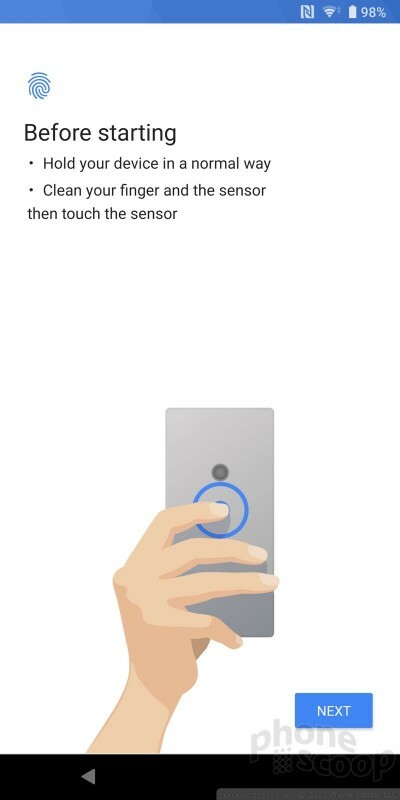 The camera button is tiny. Sony could have done better here. Sony placed the USB-C port along the bottom, but there's no headphone jack, an annoying absence on modern flagships. (Sony does include an adapter in the box.) The SIM tray is on the top and, as per the norm for Sony, can be removed with your thumbnail. I like that. 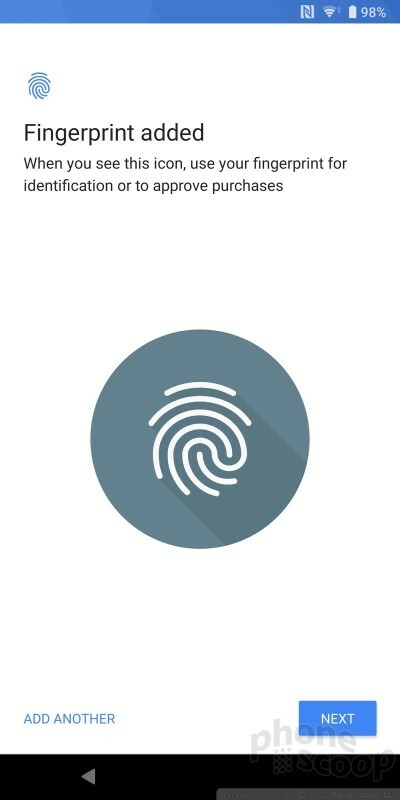 The location of the fingerprint reader is questionable. 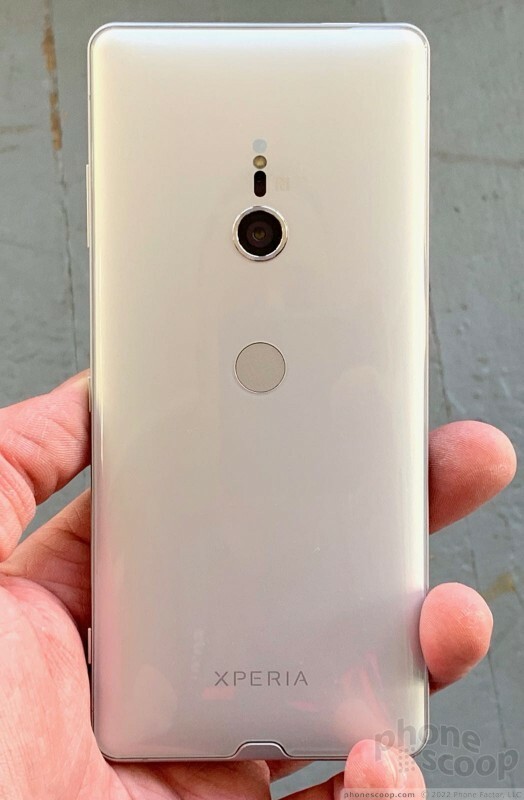 Like the XZ2, Sony put the XZ3's fingerprint reader about in the middle of the rear panel. This is awkwardly low and requires you to crook your finger a bit more than I care for. It got really old after a few days of testing. More often than not, I tapped the camera module instead, leaving photo-ruining fingerprint smudges on the lens. I'm befuddled by this arrangement. The single, circular camera module pops up a bit from the rear glass. The accompanying sensors and LED flash are lined up above the camera. You cannot remove the rear panel; the embedded battery is inaccessible. The Xperia XZ3 is as fine a phone as we've ever seen from Sony. The 6-inch display is eye-popping. It's an OLED panel with quad HD+ resolution and an 18:9 ratio. The resolution is fantastic. On-screen elements are well-defined and smooth. 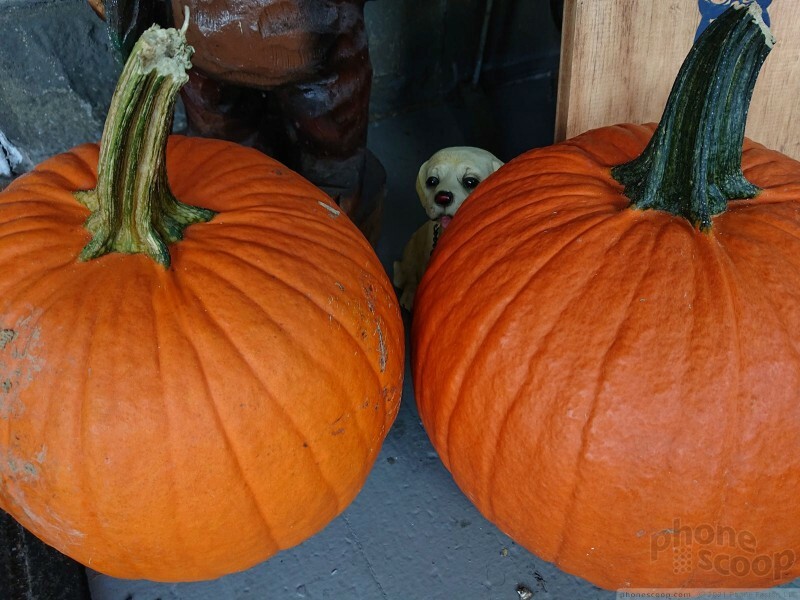 I have no complaints about pixel density, which is over 500ppi. The display pumps out an incredible amount of light. I was able to use the XZ3 indoors and outdoors under sunny skies no problem. Since it's OLED, blacks are utterly black and colors look great. 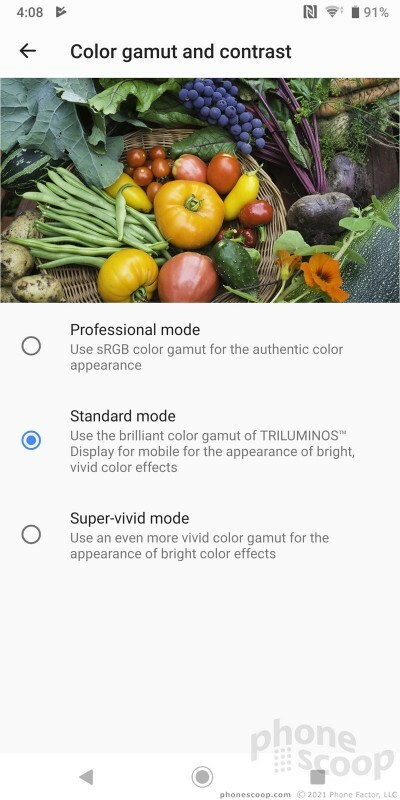 The XZ3 supports HDR playback if you can find such content. Viewing angles are very good. It's the best display to grace the face of a Sony phone. The XZ3 offers more control over the display than most phones. 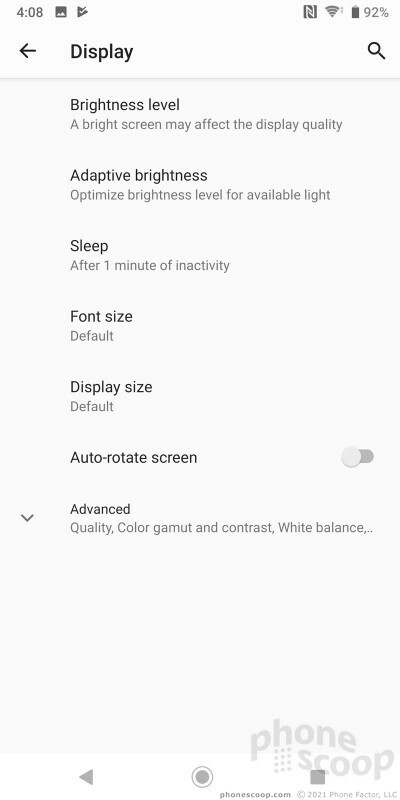 Not only can you set auto-brightness and the nighttime blue light filter, but you can also manage the color profiles, manually tweak white balance, and boost video performance (i.e. over-saturate colors when watching videos.). These settings are all fairly straightforward to adjust. 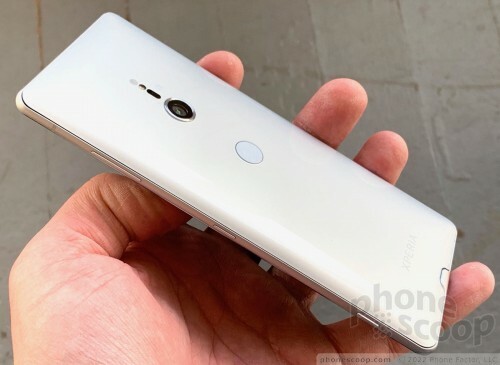 The Xperia XZ3 is available unlocked in the U.S. It doesn't have quite the support for U.S. LTE Bands that its predecessor did. It has the basic bands for AT&T and T-Mobile, and T-Mobile's newer Band 66, but not 71. This means it should perform on par with most T-Mobile-branded devices. 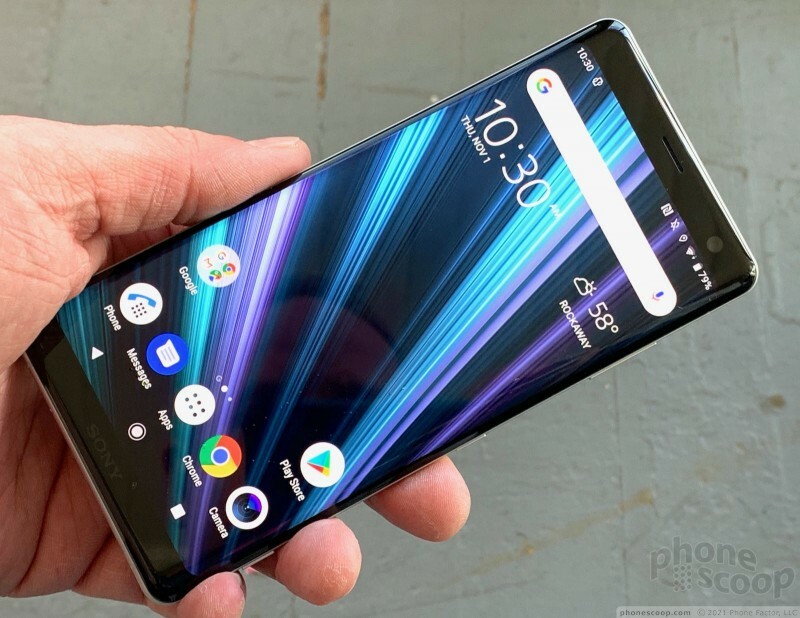 Inexplicably, the XZ3 doesn't have either Band 29 or Band 30 for AT&T, which means it won't do as well as AT&T-branded phones, and this bore out in testing. I tried the XZ3 on both AT&T and T-Mobile and found that, owing to its band support, it performed better on the Un-Carrier than Big Blue. On T-Mobile, nearly all calls connected on the first dial, even under the worst network conditions. Calls remained engaged during miles of highway driving on both networks without interruption. Data speeds were very good. I was able to download apps over LTE, as well as browse social networks, stream media, and surf the web without any hiccups. On AT&T, the biggest issue is LTE performance. In areas with congestion, you'll likely notice slower speeds because the XZ3 isn't able to use the newer bands, which are sometimes less crowded. That said, calls connected on the first dial and data speeds were fine most of the time. 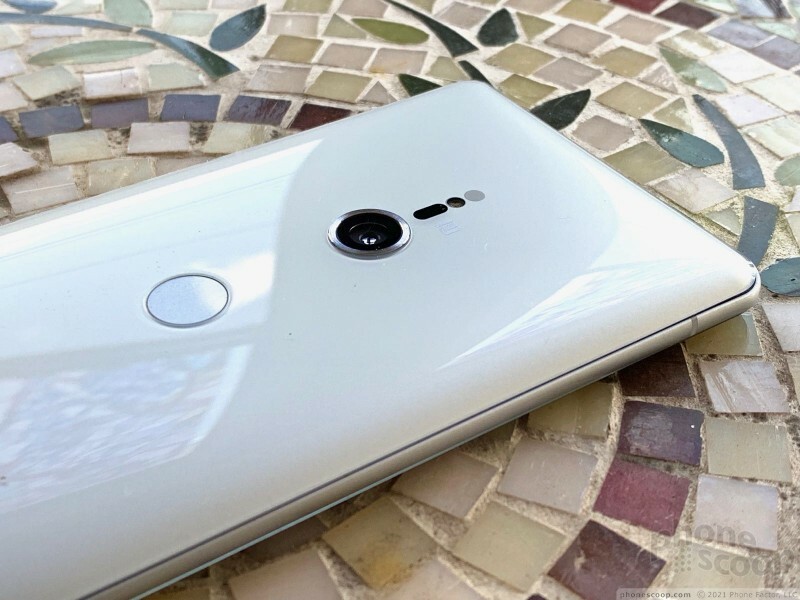 As far as call quality is concerned, the XZ3 does all right. Voices sound clean and warm through the earpiece. I was pleased with tone and clarity. Volume was reasonably good. 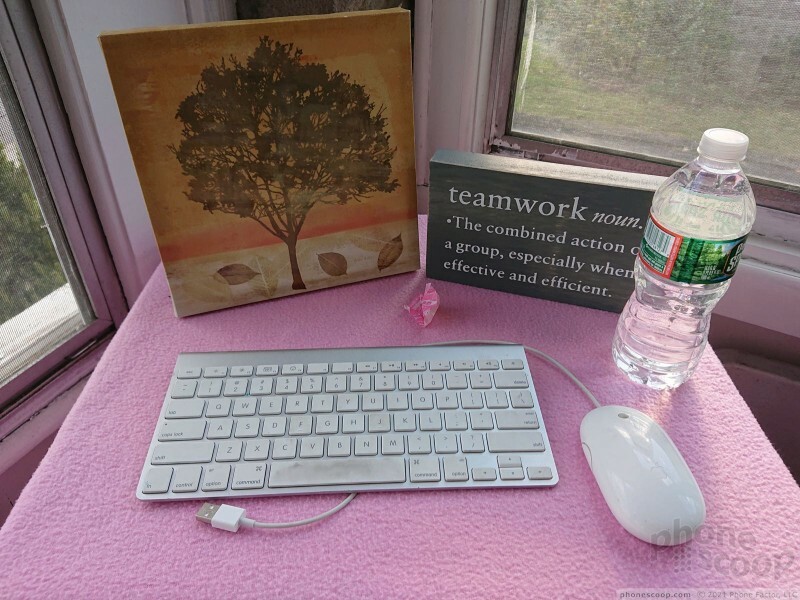 I was able to handle calls on the sidelines of soccer games and running errands at the mall. 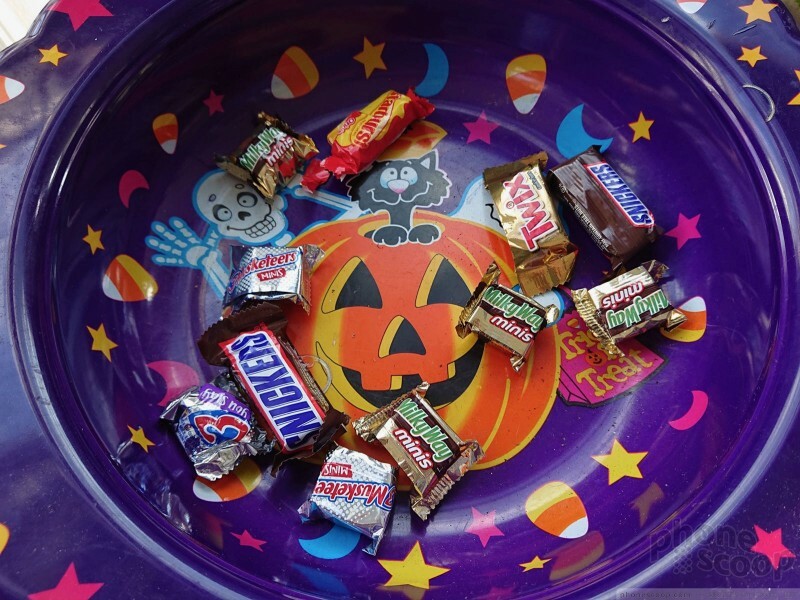 A room full of screaming 11-year-olds, however, had me running for cover. 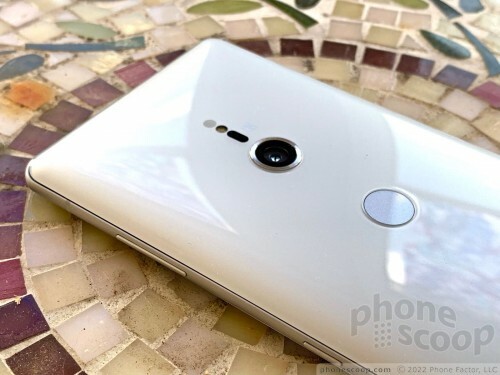 Those I spoke to through the XZ3 said I sounded "excellent." Calls pushed to the speaker are loud, thanks to the powerful amplifier. 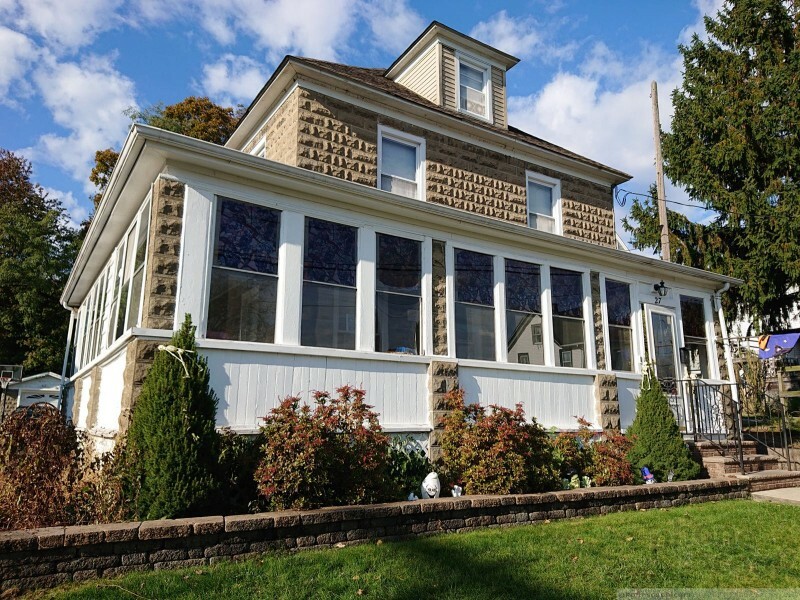 You will notice some distortion when you set the volume to the max, but you'll be able to hear calls in moving cars or just about anywhere else. Ringers and alerts are very loud. 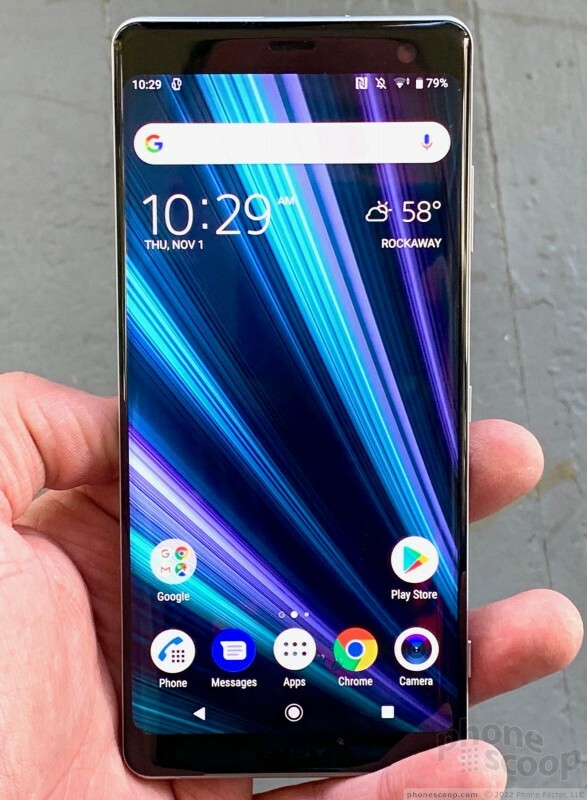 The XZ3 carries over Sony's S-Force Front Surround. It's nearly imperceptible to the eye, but there is a tiny, tiny notch in the front glass right where it meets the bottom portion of the frame. This is your speakerphone and the second speaker needed to create stereo sound. Like many such implementations, the bottom speaker is somewhat more bass-y and the top is somewhat more treble-y. The system works surprisingly well and generates clean, loud sound that's good for watching video with stereo sound. The XZ3 also includes Dynamic Vibration, which is kind of a subwoofer for your phone. Dynamic Vibration taps the haptic engine to vibrate the device when listening to music or watching movies. The result adds dimension to the sound. It's cool. It may not be practical, but there's nothing wrong with having a little fun with your movies. The haptic engine also delivers a good jolt when it comes to alerts. 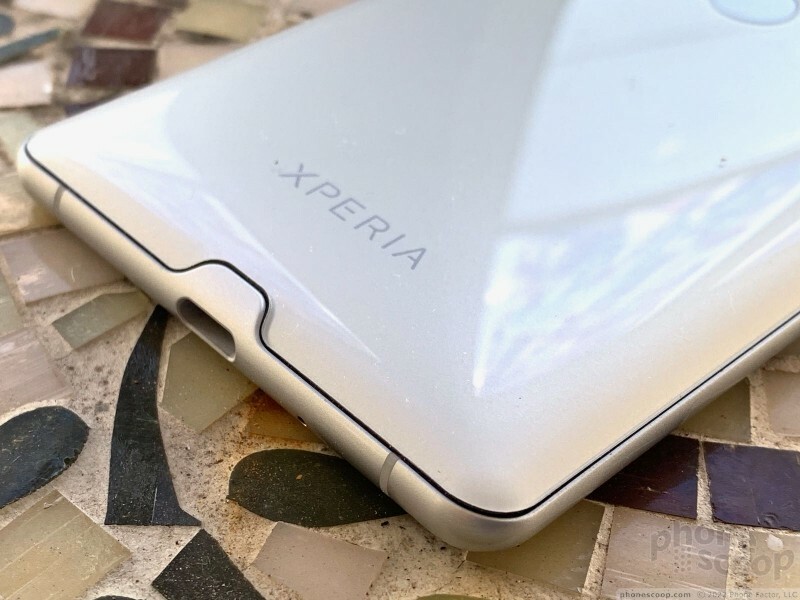 Sony improved upon the XZ2's battery slightly by boosting it from 3,180mAh to 3,300mAh for the XZ3. On days that I used the phone normally — general app usage, browsing social media, sending messages — it easily pushed from breakfast to bedtime with plenty of power to spare. If you ramp up usage of the camera or games, you'll notice it konks out a bit earlier. I never saw less than a full day from it. Sony's Stamina Mode and Ultra Stamina Mode will help extend battery life if you find yourself running short. While the former tamps down vibrations, notifications, brightness, and processor output, the latter puts the XZ3 into feature phone mode and shuts down most apps. The XZ3 supports Quick Charge 3.0 for quicker power-ups, as well as Qi wireless charging. Plugging in for as little as 20 minutes boosts the battery by as much as 25%. Sony didn't skimp on the secondary radios. First up, Bluetooth 5.0 with support for aptX. This is a good start for audiophiles, and Sony is always looking to attract audiophiles. The phone connected to various headphones, speakers, and my car painlessly. Calls routed to headphones and my car sounded clean. Music streamed to aptX-capable headphones sounded above average. The GPS radio performed flawlessly. It pinpointed me in a snap and accuracy was as close as about 10 feet. The NFC radio made for easy pairing with select Bluetooth accessories. It also supports mobile payments via Google Pay, which I was able to set up no problem. The WiFi was fantastically quick. The phone includes its own VPN software, which I highly recommend you activate. 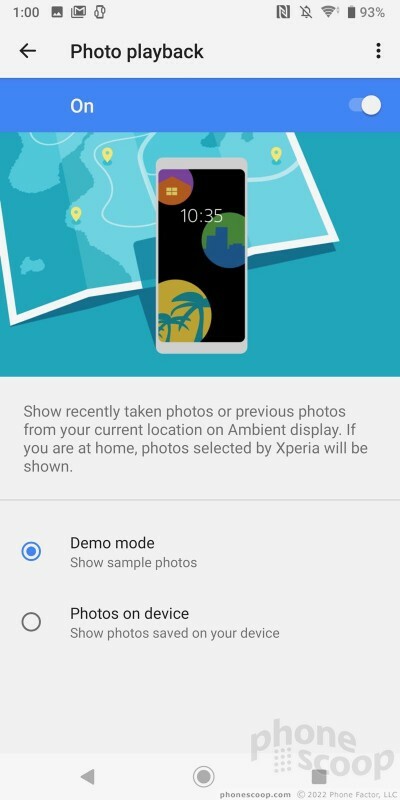 Sony gave the XZ3's lock screen an ambient display that's more customizable than most. 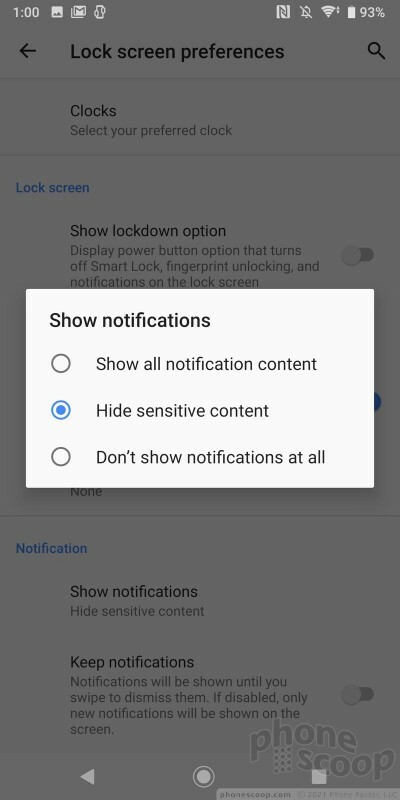 It doesn't stay on consistently by default; instead, it comes as goes as needed when notifications arrive. 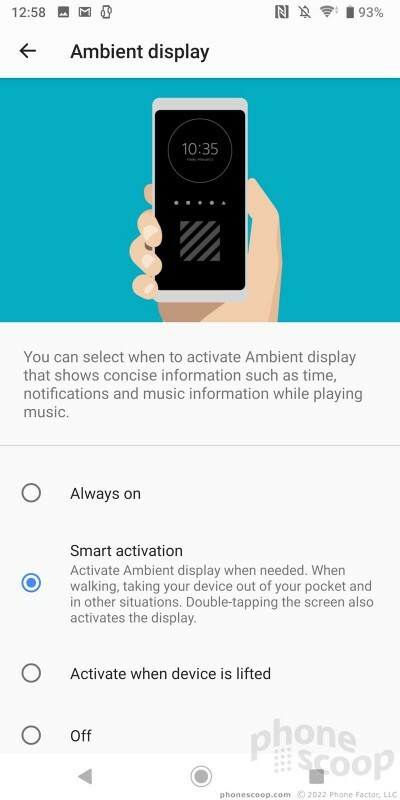 You can choose to turn it on all the time or set it to light up when the device is picked up. 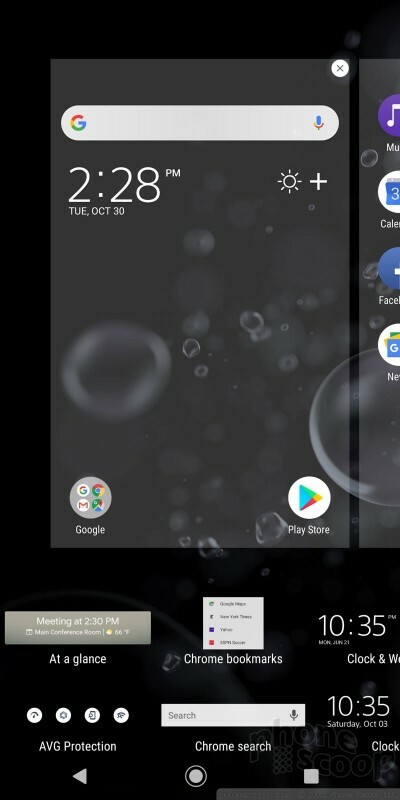 It shows the clock in white near the top of the screen. 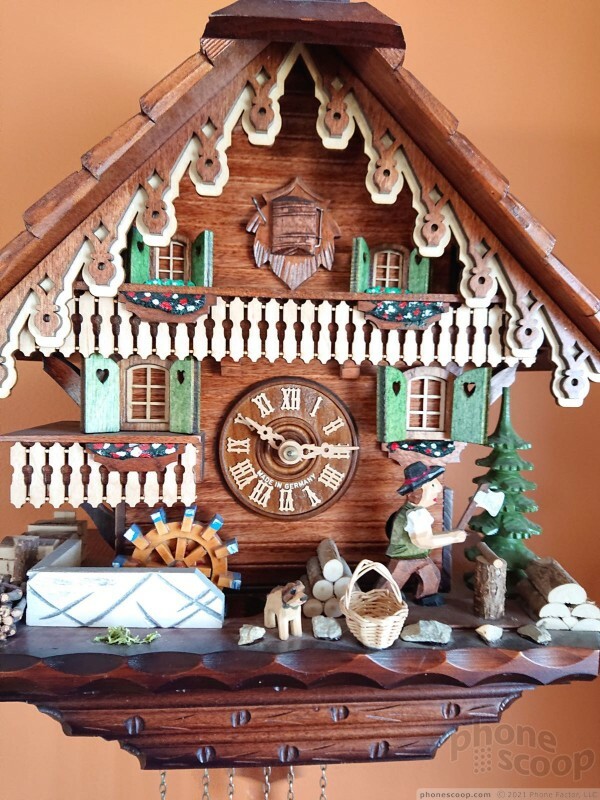 Several different clock styles are available. 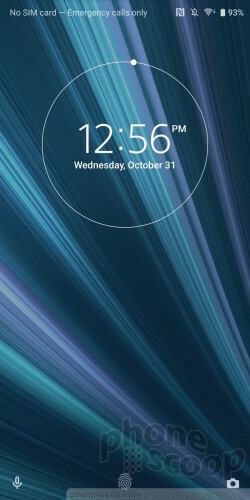 Basic status indicators and notification badges appear in the space below the clock. You can also choose to put stickers at the bottom of the ambient screen, as well as photos if you really want to go crazy. 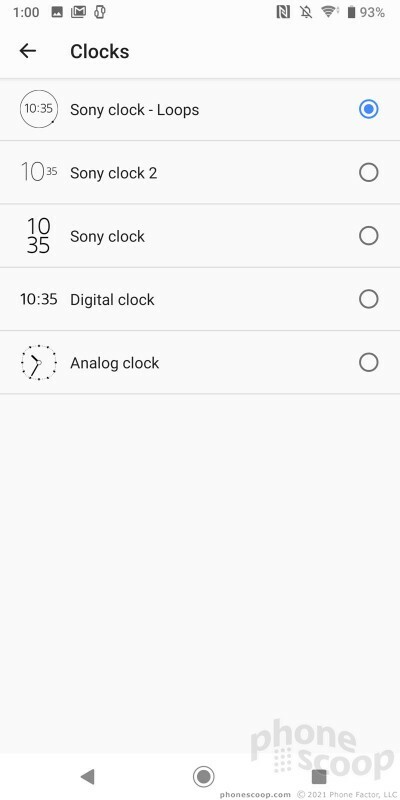 A quick press of the XZ3's screen lock button wakes the display fully and reveals the clock, notifications, and two shortcuts: voice search and camera. (You can't customize the shortcuts.) As always, you can choose how visible notifications are on the lock screen and even control the LED indicator light. 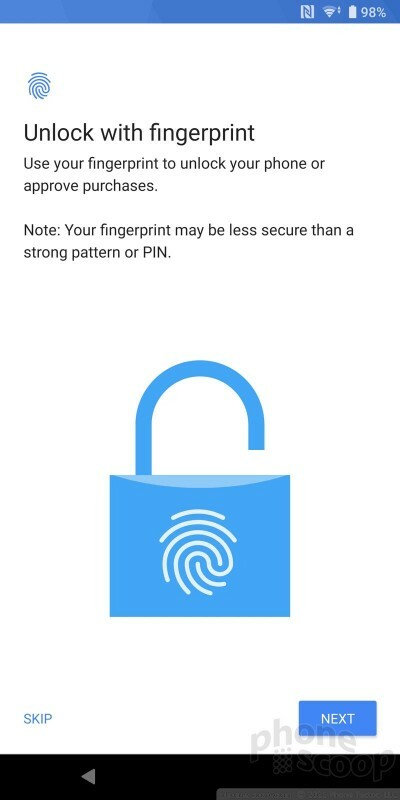 Security features are typical for a flagship device. Training several fingerprints takes no time at all and the reader is quick and accurate most of the time. 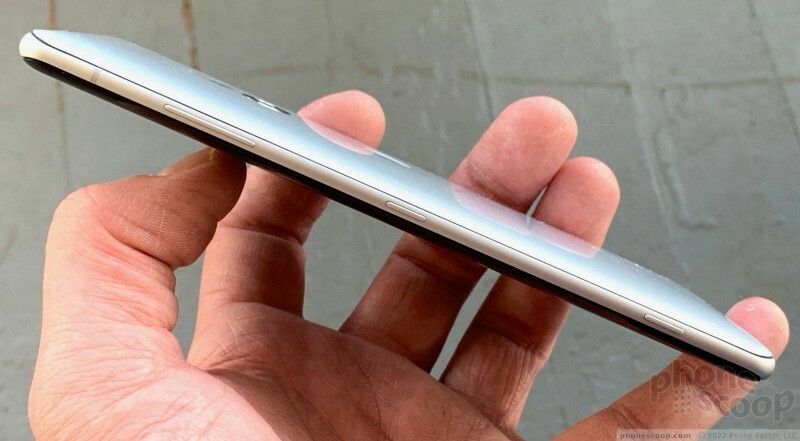 It's a bummer that the fingerprint reader is in such an odd spot on the rear. 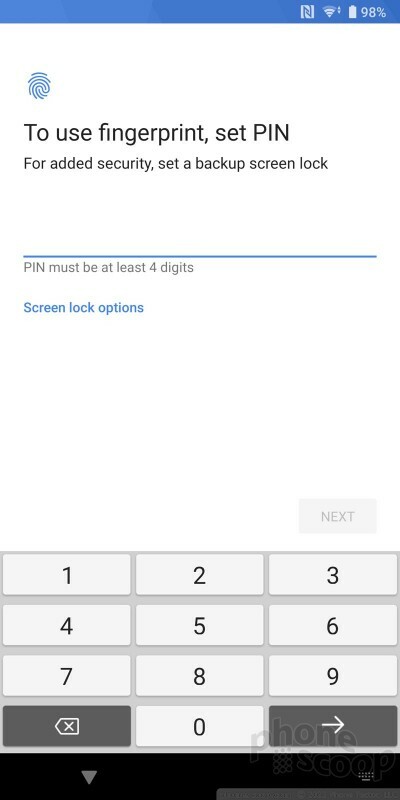 Other options, including PIN, pattern, and password, are also available. There's no face scanner. 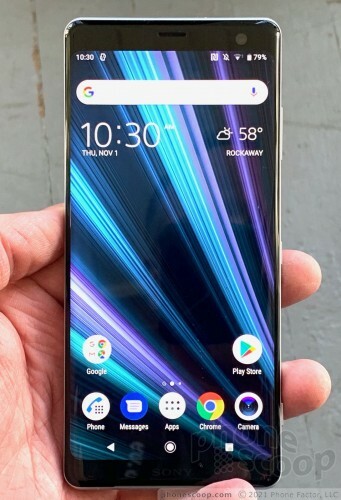 The Xperia XZ3 is one of the first phones from a major manufacturer to ship with Android 9 Pie installed. It's nice to see Sony get it on the phone so close to the platform's launch. You can manage the home screens however you prefer. You can adjust the grid size, the icon size, add widgets, screen transitions, and much more. 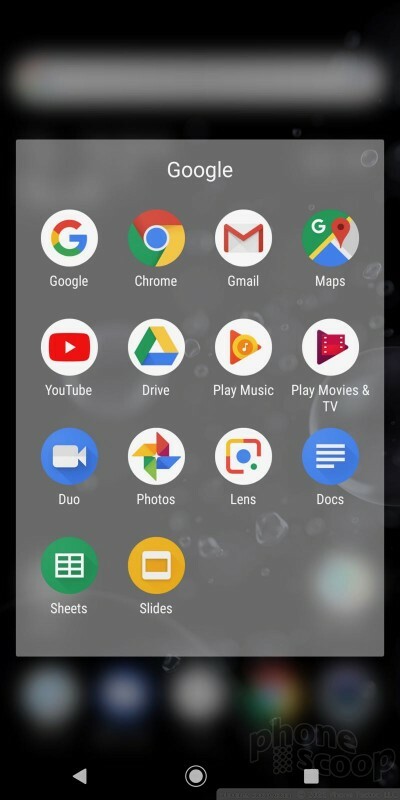 The app drawer, available via dedicated button in the home screen dock, is arranged in side-by-side pages that you swipe left and right. You can opt to view apps in custom order, most used, alphabetically, or by date. A search tool is always available in the app drawer, which is nice. The app drawer also supports folders. 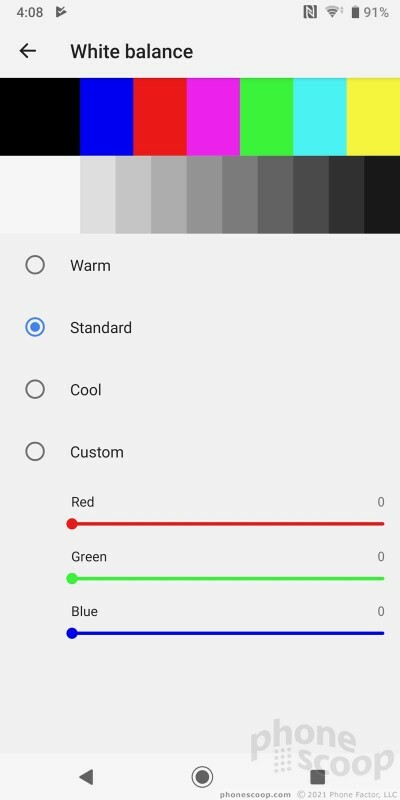 The settings menu functions mostly like standard Android, but is brightened up by a welcome splash of color. The controls are laid out simply. There's a handy search tool. 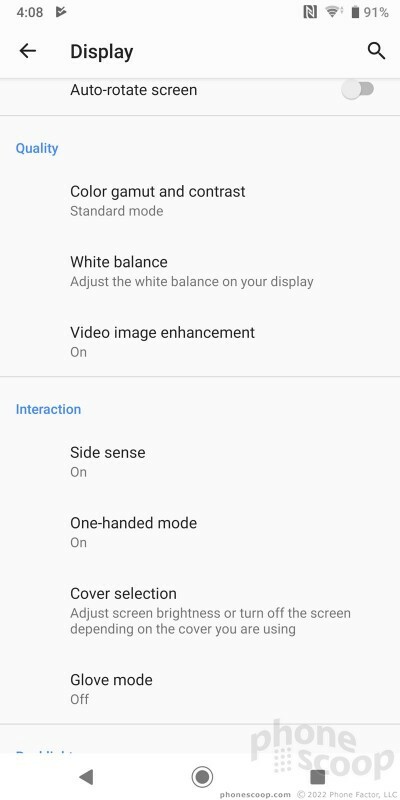 Sony has gotten rid of themes, but does include a one-handed mode that shrinks the interface down for easier use. Side Sense is on board and it is as flighty as ever. 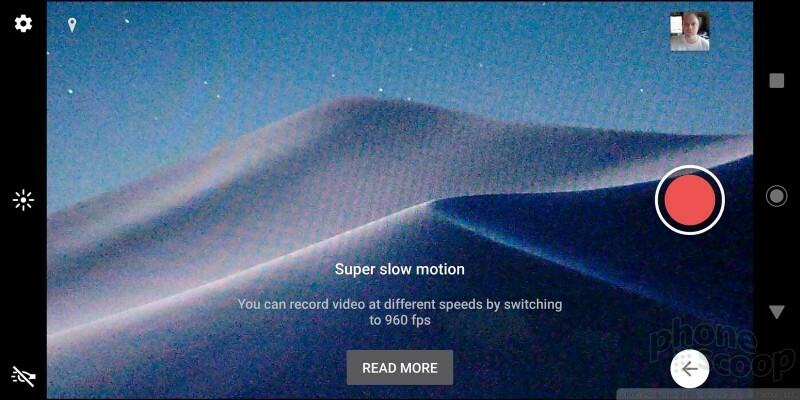 This feature is similar to Samsung's Edge Screen. 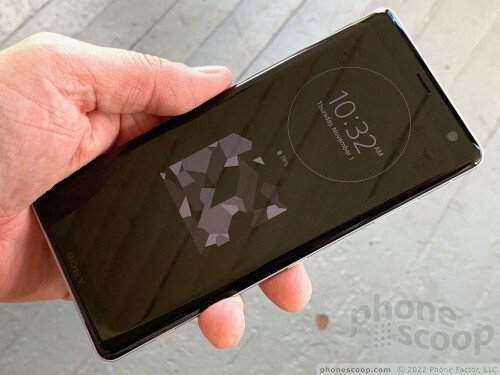 Tapping either side of the Xperia XZ3 will call up the Side Sense drawer. 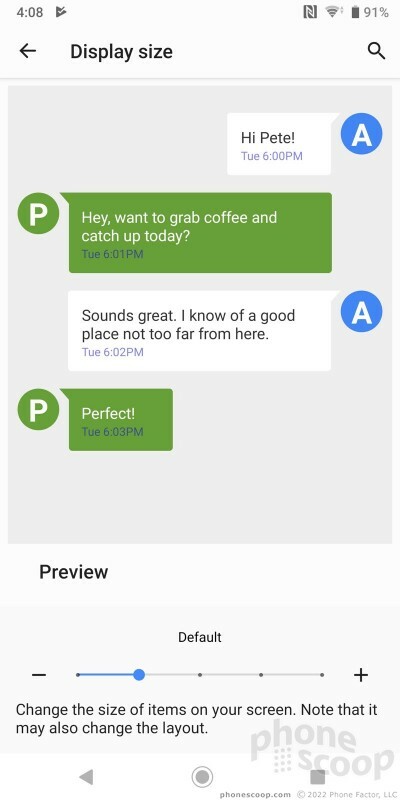 It's a customizable space where you can put shortcuts to apps, contacts, and so on. It looks clean, but getting it to open on the XZ3 is frustrating. 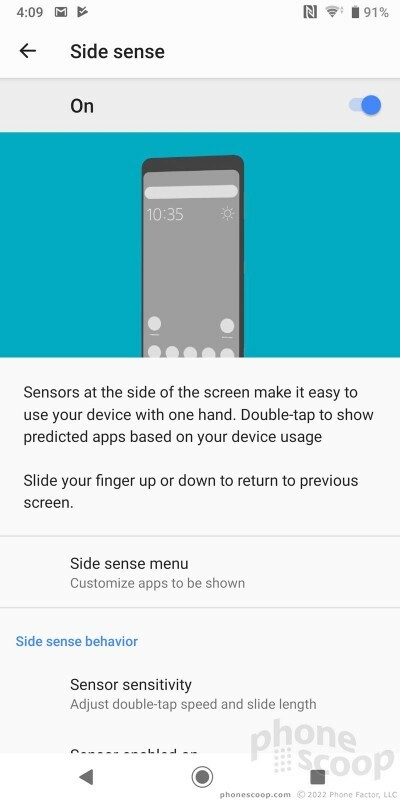 There are sensors buried in the side of the screen that are supposed to open Side Sense when tapped. The issue is I could never find the right place to tap. Side Sense only ever seemed to open by accident. Thank goodness you can turn it off. The Xperia XZ3 is plenty quick. It packs the top-end Qualcomm Snapdragon 845 processor with 4 GB of RAM. Many of today's flagships have made the jump to 6 GB of RAM, and more than a few offer an 8 GB option. I'm rather surprised Sony stuck with just 4 GB. That said, the phone performed very well. 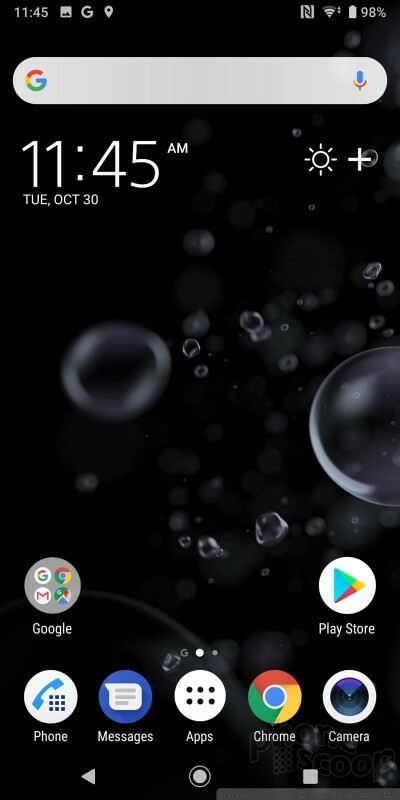 The XZ3 never felt slow, screen transitions were liquidy, and the majority of apps popped right open. The camera continues to be a top priority for Sony. The quickest way to launch it is to press the dedicated camera button. The camera app opens very quickly. 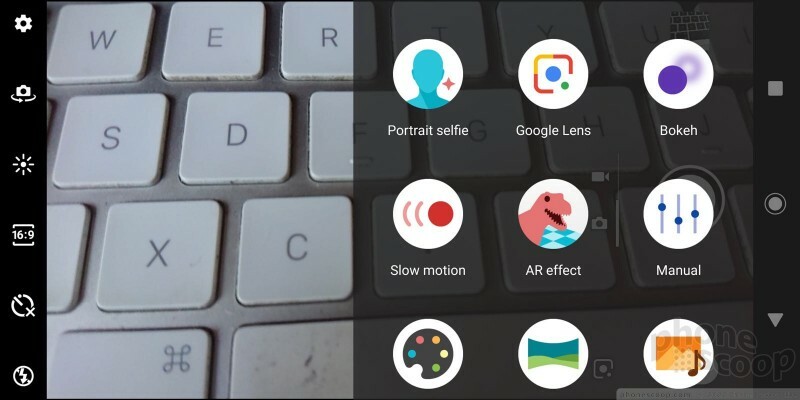 Sony has completely overhauled its camera app. I don't think it makes any great leaps forward in usability, but it's fine. The basic viewfinder includes controls for the flash, timer, aspect ratio, and white balance. 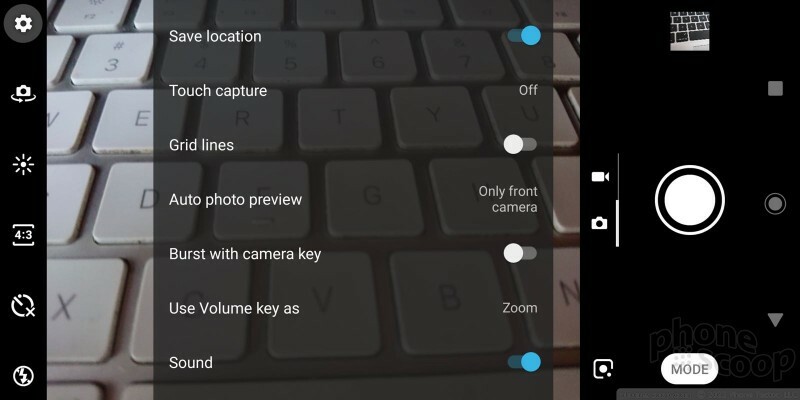 A simple toggle lets you switch from camera to video camera. 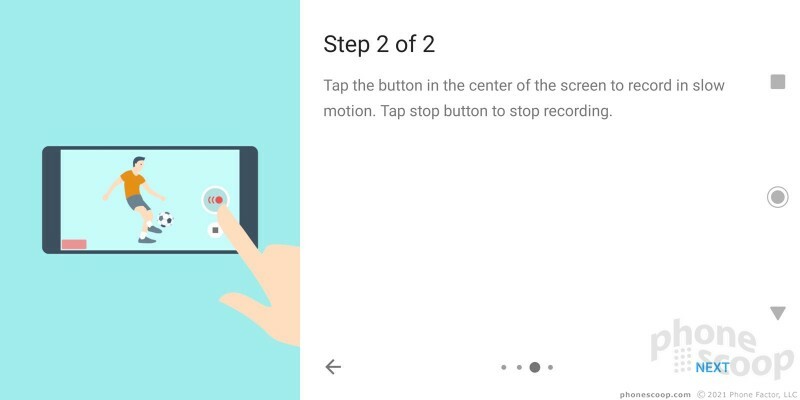 When you jump to the video camera, a second software button shows up so you can capture still images while recording video. 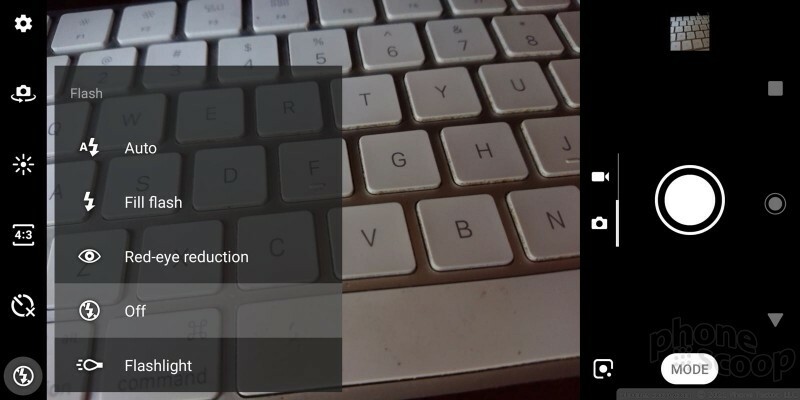 The mode selector is below the camera button. All the Sony hits are here. 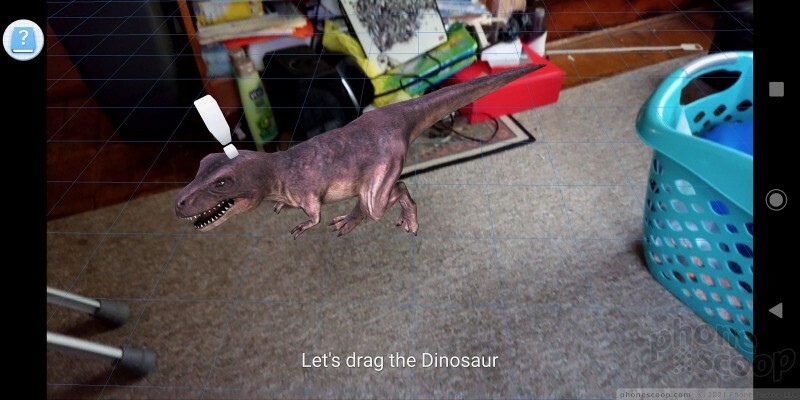 The XZ3 includes Google Lens, AR effect (put dinosaurs in your pix), Creative Effect (live filters), Sound Photo (takes photos with background sounds), panorama, selfie portrait, bokeh, slow motion, and manual. 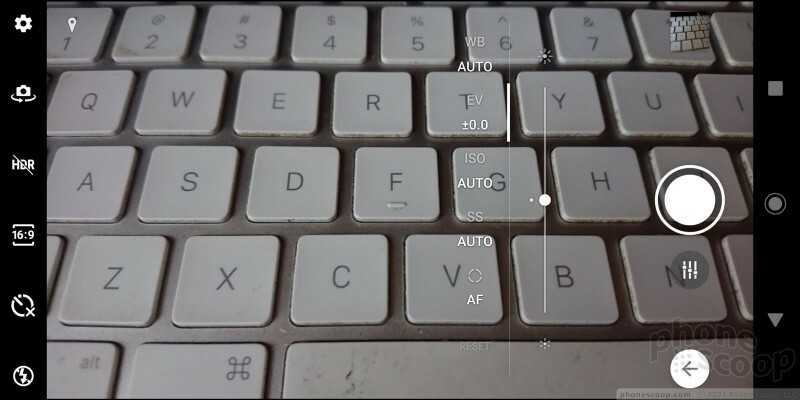 Manual Mode allows you to set white balance, ISO, brightness, shutter speed (but only up to 1 second), and focus. It's relatively easy to use. I'm surprised the manual mode doesn't support longer exposures. 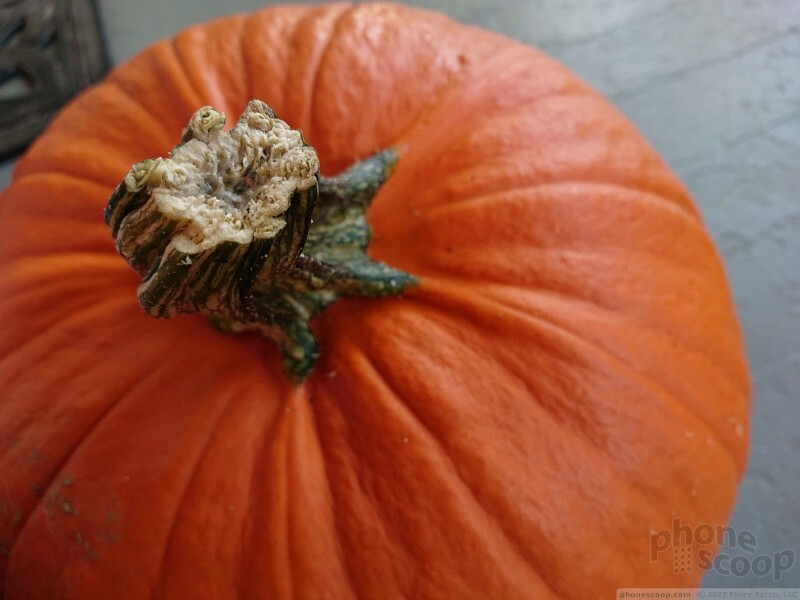 The XZ3 adds a dedicated bokeh tool for taking more artistic photos. It's an odd one. You need to tap the item on the screen you want to be in focus. Bokeh is really fussy in that it wants the subject to be about 1.5 feet away from you when shooting. The camera then asks you to hold still while it shoots two photos. (Remember, the phone has only one lens, rather than two like many competing phones.) The XZ3 then combines the results of the two photos and allows you to make some edits right away, such as the strength of the background blur. 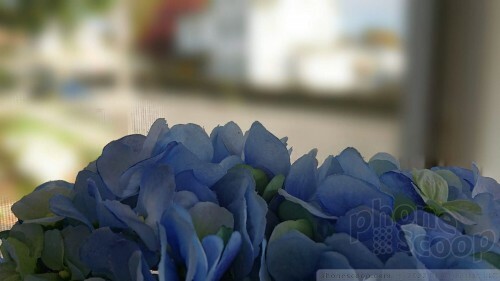 It's not nearly as intuitive or useful as nearly every other bokeh mode I've tested in the last year. Conversely, Sony's super slow-motion tool is a cinch to use. 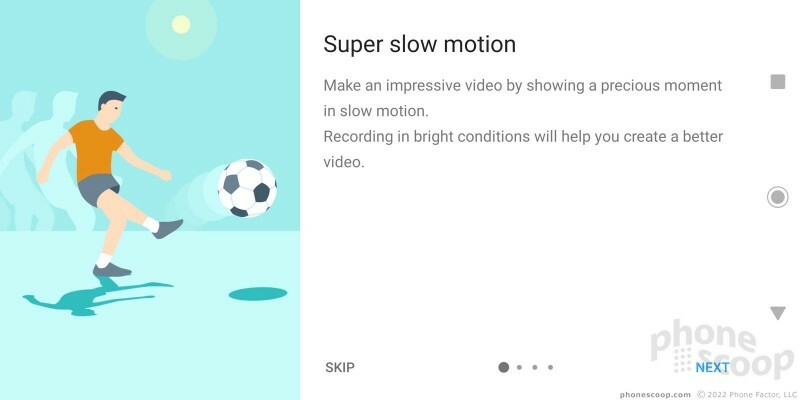 Switch to slow-mo mode, start recording video, and when you see something you want captured in super slow-mo, hit the secondary button and bingo. 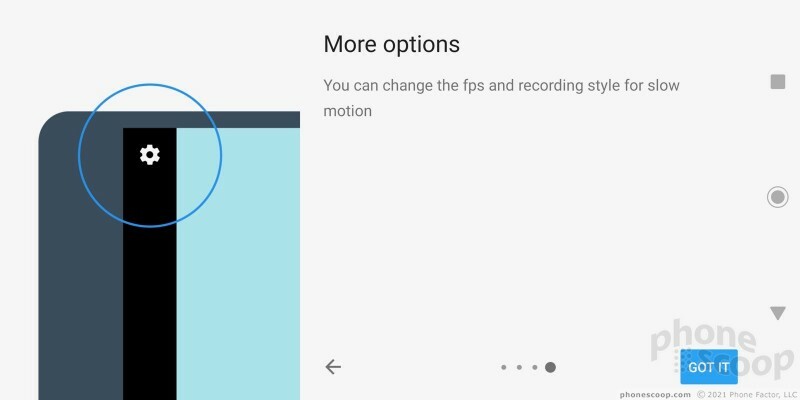 The XZ3 can capture 960fps slow-motion in 1080p, rather than just 720p. Few other phones can do that this year. 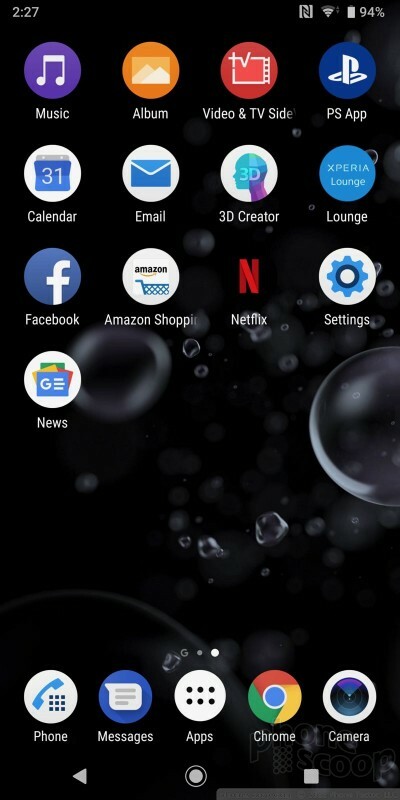 I really like that Sony allows you to jump right to bokeh or AR effect via dedicated shortcuts that you can drop in the app drawer or place your home screen. The selfie mode is fairly advanced. You can adjust the strength of the blur effect, as well as adjust the size of your eyes, the width of your face, and the clarity of your skin. I appreciate that it offers you a preview of these changes before you snap the shot. Everything about the camera is fast. 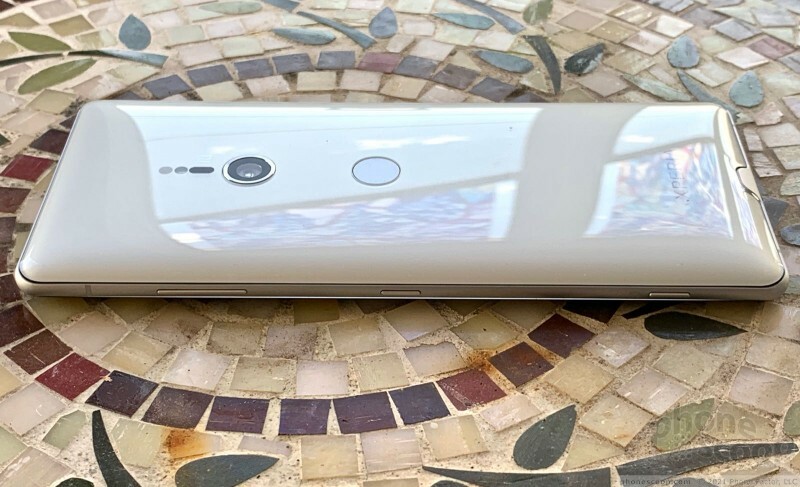 The XZ3's 19-megapixel camera hardware is a direct carry-over from the XZ2. 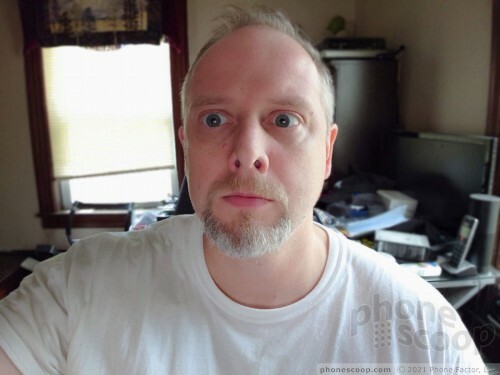 The default setting is 17 megapixels at 16:9. If you want the full pixel count you need to switch to 4:3. The Exmor RS sensor has a 25mm lens at f/2.0 with low-light photo capture up to ISO 12,800 (ISO 4,000 for video). The XZ3 keeps up with the competition. The majority of snaps I captured were clean, sharp, and accurate. Focus was almost always crisp. White balance and color were true-to-life, with only small deviations. Daytime shots were free of grain or noise. I did see a fair amount of grain/noise in low-light shots. This is one area Sony can't match Apple or Google. Let's not forget, the placement of the camera lens means you may often smudge it with your finger. Check it often, as fingerprint oil definitely prevents your shots from looking their best. 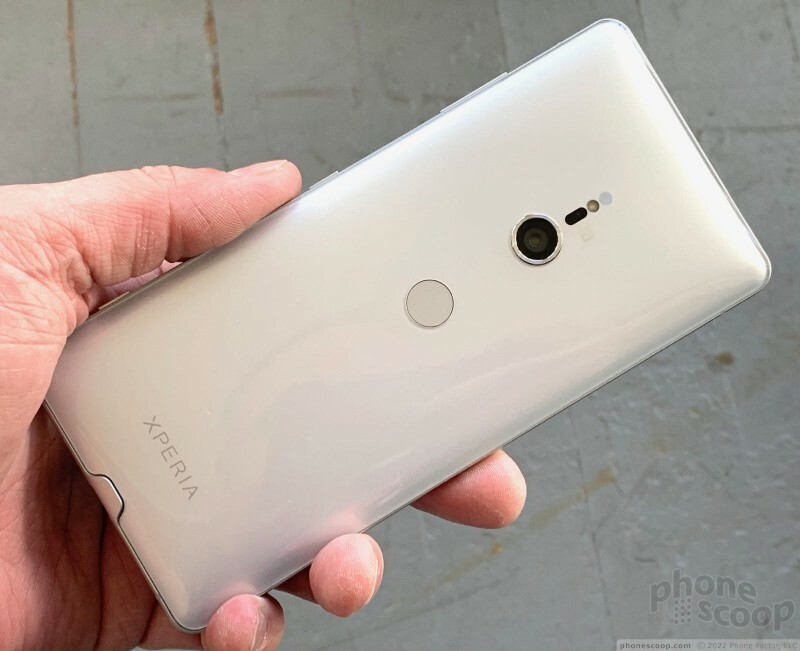 The 13-megapixel selfie camera is a big jump up from the XZ2's 5-megapixel shooter. 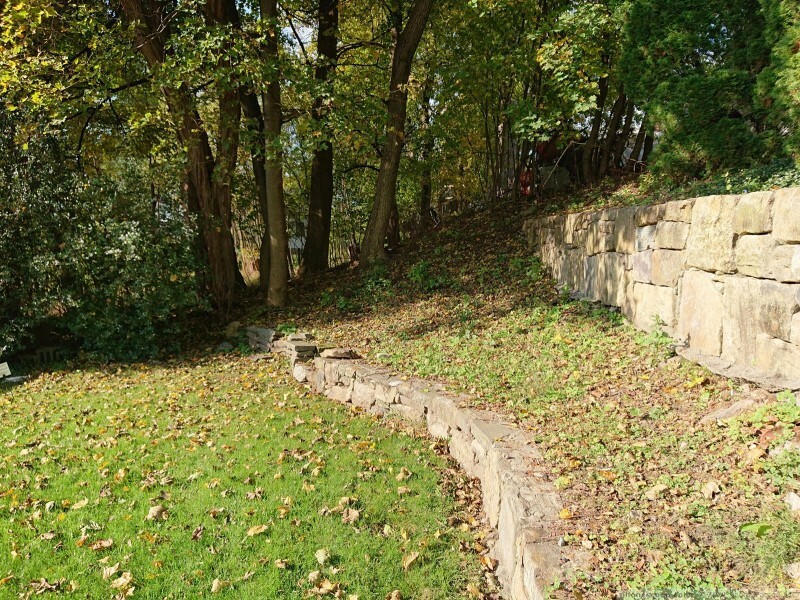 Results vary widely depending on what you do with the settings. If you dial back all the bokeh and beautification tools, the XZ3 takes sharp, clean selfies. 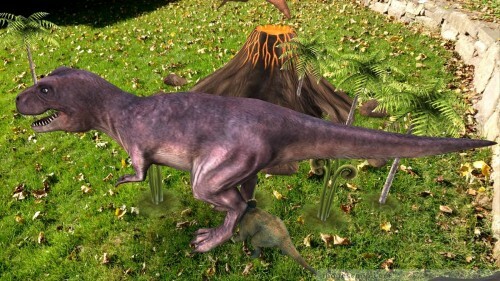 Images are colorful and properly exposed. The only thing I disliked was some grain that appeared in low-light shots. The screen-based selfie flash helps a bit in low-light situations. 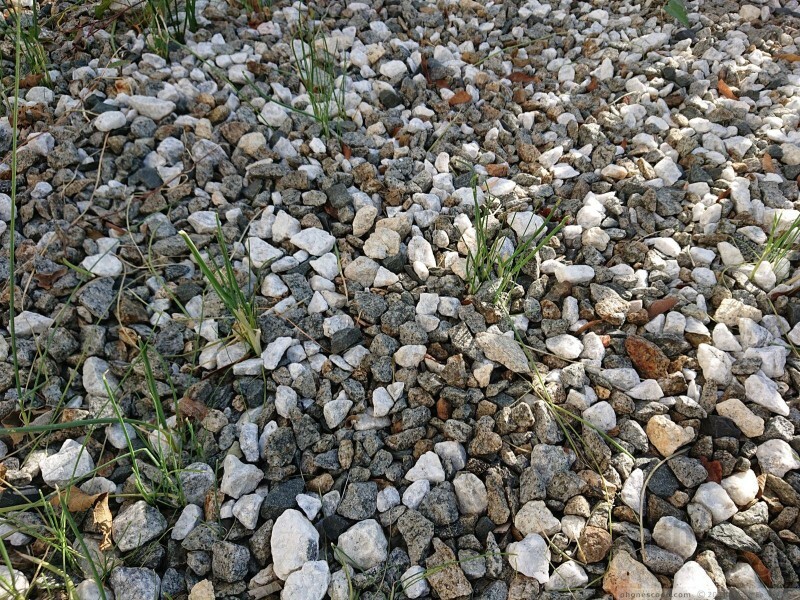 If you do use all the tools, you may find everything looks a little too soft. 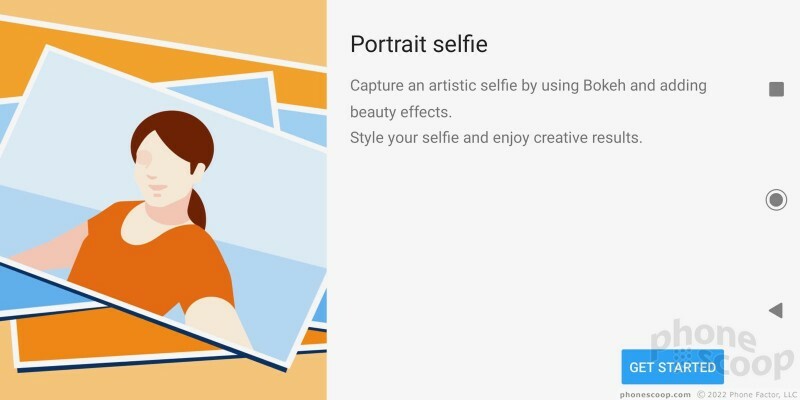 Weirdly, Sony dropped the wide-angle selfie feature just when other phone makers (Google, LG) started adding it. The XZ3 shoots video up to 4K (Ultra HD) resolution in HDR. The standard full HD video I shot with the XZ3 was perfect as far as focus, exposure, and color were concerned. 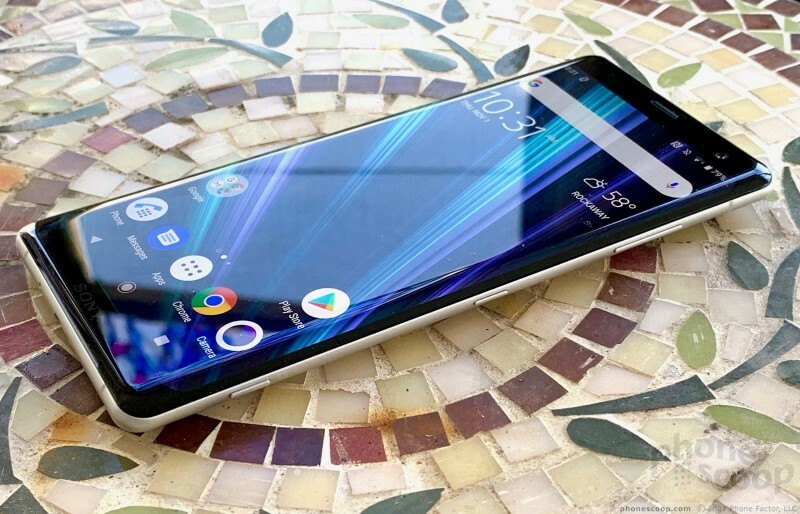 This Xperia is the top Sony device for video. 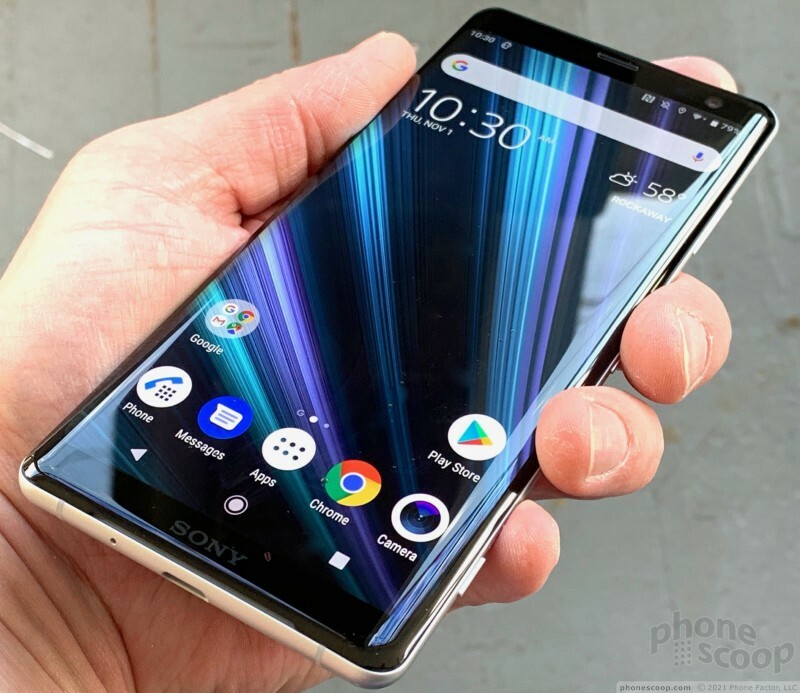 The Xperia XZ3 is Sony's best-ever phone. It's the most gorgeous piece of hardware to come from the company and it's as well-made as you expect for a phone at this level. The glass and metal form a smooth, luscious shell around the powerful silicon inside. You'll find an outstanding display, solid call quality, decent LTE performance, and battery life that's on par with other phones in this class. 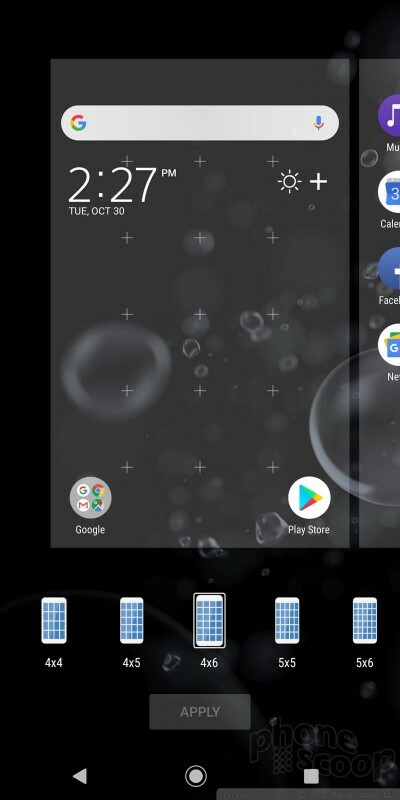 I'm glad the XZ3 is waterproof, though I'm bummed there's no headphone jack. 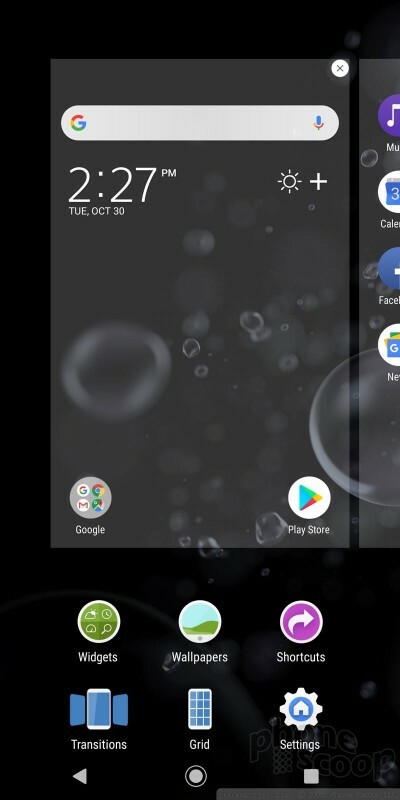 The Android 9 Pie-based user interface is slick and offers a bevy of tools for customization. The ambient display is particularly powerful. Some may find Sony's skin overkill, but I think it adds more value than it subtracts. I find the new camera app only slightly more user-friendly than the old one, and the XZ3 takes photos and videos that are close to that of competing flagships. 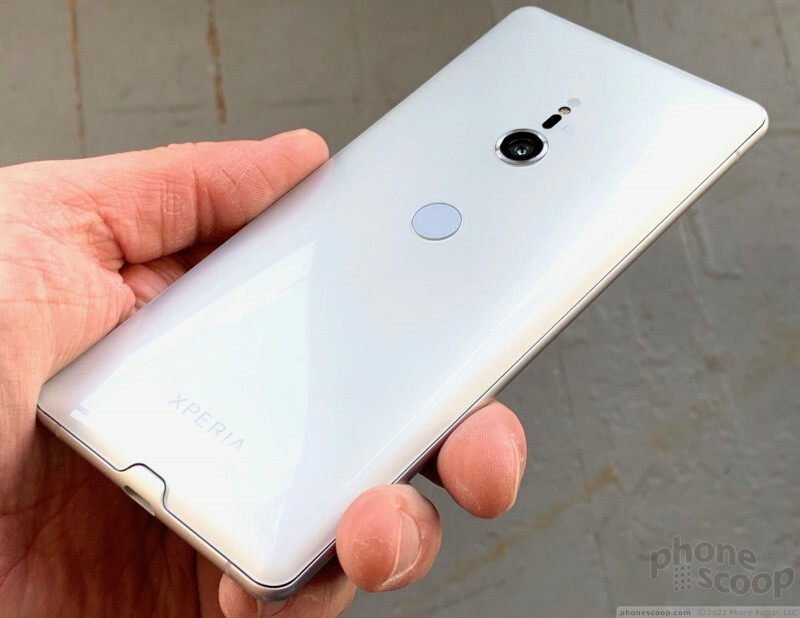 Sony sells the Xperia XZ3 unlocked online. It costs a hefty $900. Without a carrier to help break up that cost, you have to front the whole price right away. 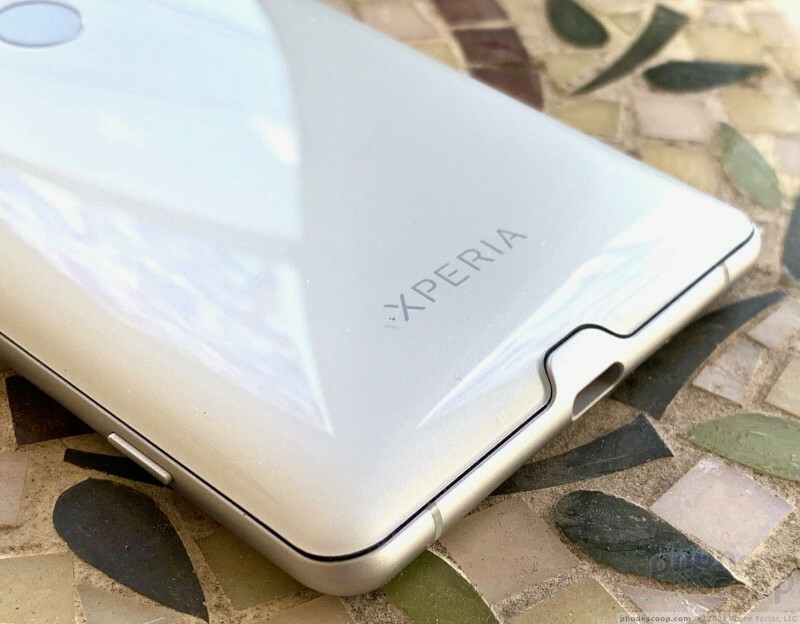 Given the $1000+ price points of competing iPhones and Galaxies, that $100 goes a long way toward making the Xperia XZ3 an attractive alternative. Sony today announced the Xperia XZ3, the company’s latest flagship phone. 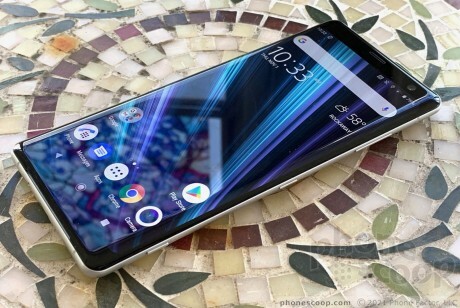 The device improves upon its predecessor, the XZ2, by amping up just about everything.